The garden is full now with vines, and flowers. Yesterday I discovered beneath all the foliage two small bell peppers. The zucchini, cucumber, and melons aren't bearing fruit yet, but I guess they have the entire summer to do their work. 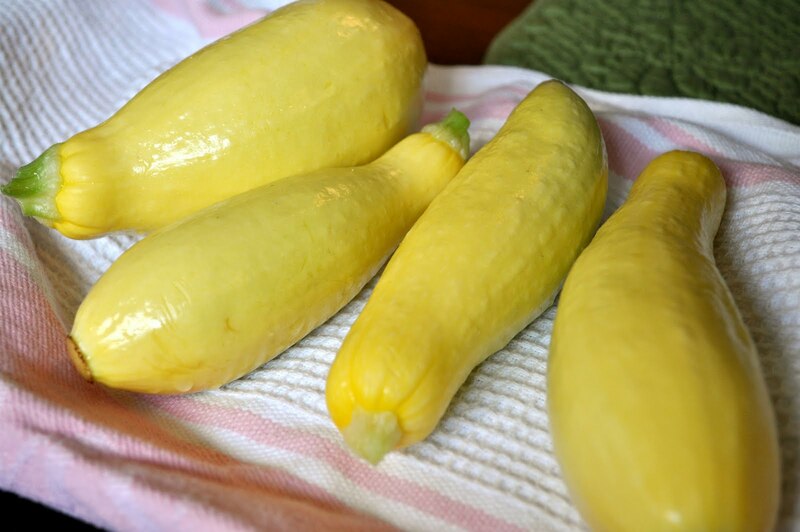 Our latest harvest resulted in four perfect yellow squash. I've never eaten fried squash blossoms, but since we have a surplus, I thought I'd find out for myself why they are considered a delicacy and make squash blossoms stuffed with ricotta. I learned the difference between male and female flowers and picked about 10 male blossoms (on second thought, I hope I left enough to pollinate the rest of the females!). The blossoms were open in the morning--that's the time of day when they get pollinated—but closed by the time I picked them in the afternoon. The petals are thin and gauzy, and tear easily. They would have been easier to stuff if I had picked them earlier in the day but, in hindsight, I probably preserved the next harvest by allowing time for the bees to do their thing with the pollen. 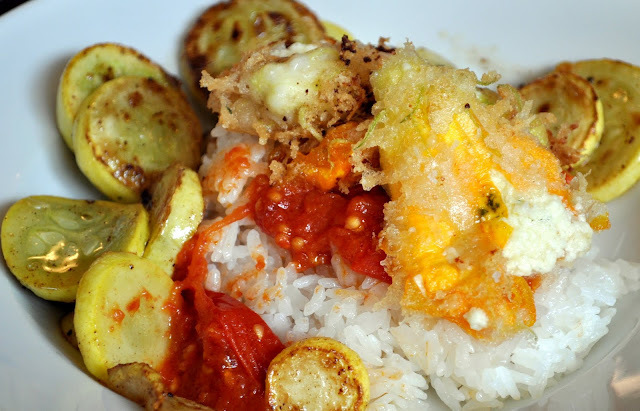 We ate the blossoms and tomato sauce over rice, with a side of sauteed squash. The tomatoes paired well with the cheese. It felt good to make a meal out of our own garden. The blossoms were so delicate and so so delicious. I mean, they were amazing. The mint mixed into the ricotta was perfection and deep frying each blossom was just the thing. 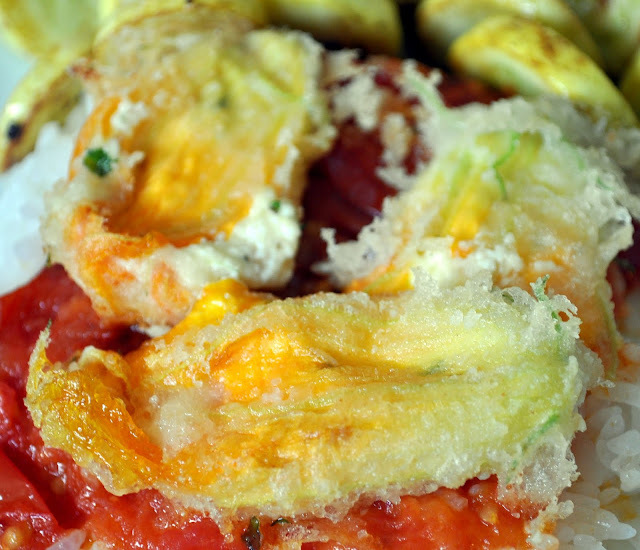 Since I later realized that this dish is meant for zucchini blossoms, not yellow squash blossoms, we'll no doubt be making it again soon. I'm already looking forward to it. I love Alice Water's vegetable cook book as it is arranged by vegetable. Amazing recipes and art work as well! Squash blossoms,very nice, and unique. Our garden should yield lots of tomatoes and peppers. I plan to stuff peppers with cheeses and roast them on the BBQ (Hot appetizers) made using a gadget from Williams & Sonoma, a gift from my children. Ain't life sweet!